I’m so excited for today’s giveaway: DaySpring’s Words Matter – You’re Loved LetterPress Block Set or build your own $100 worth of Letterpress Blocks. One Winner will be randomly selected (U.S. residents only). Enter at the end of today’s post. But first — A Special $1.99 eBook Sale! But first — for less than a cup of latte (!) 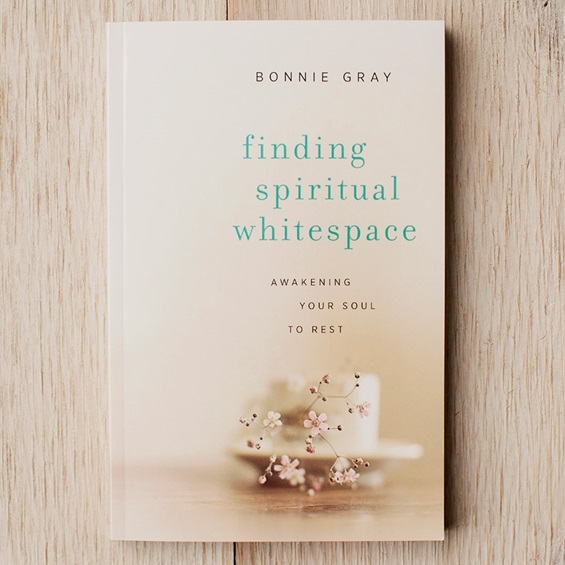 — you can order my book Finding Spiritual Whitespace: Awakening Your Soul to Rest for a special eBook sale price today! If you haven’t read it yet, please do! 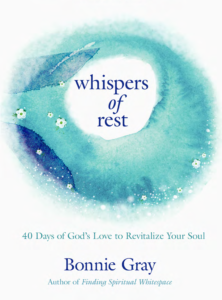 Order copies to gift it to your friend, sister, women’s leader, or anyone who’s longing for rest this year! I’ll take you on a journey to make space to rest and refresh your soul with Jesus — as I we see God transforming brokenness into beauty! Check out the beautiful stories you’ve shared on the Amazon reviews! God is touching us so deeply, kindreds! Take a moment to refresh your soul. 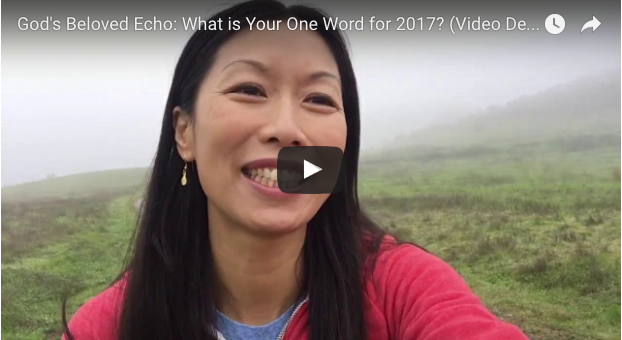 Click below to view today’s video: God’s Beloved Echo: What Is Your One Word for 2017? Hi, this is Bonnie Gray and I want to say happy new year as we step into a new clean slate. Well, I brought you here on this trail and last time, it was raining, so this time, I came prepared and I brought my umbrella. But it turns out that it’s not raining. Well, you see in back of me, this beautiful mist that has blanketed the trail. It’s the fog. And it’s wonderful because in this new year, I want to ask you: What is One word God has put on your heart? It’s so beautiful because just like the umbrella that I brought with me, God’s word can cover us in His presence and His peace. No matter what kind of weather we may step into — into this new year. Now, I want to share my One Word with you — and I want to hear your One Word too! for He shields him (do you hear that echo — “shielding and covering?”) all day long. Oh, it’s such a beautiful verse! So, my One Word is BELOVED. What’s your One Word? Now, share with me in the comments. I’d love to hear! 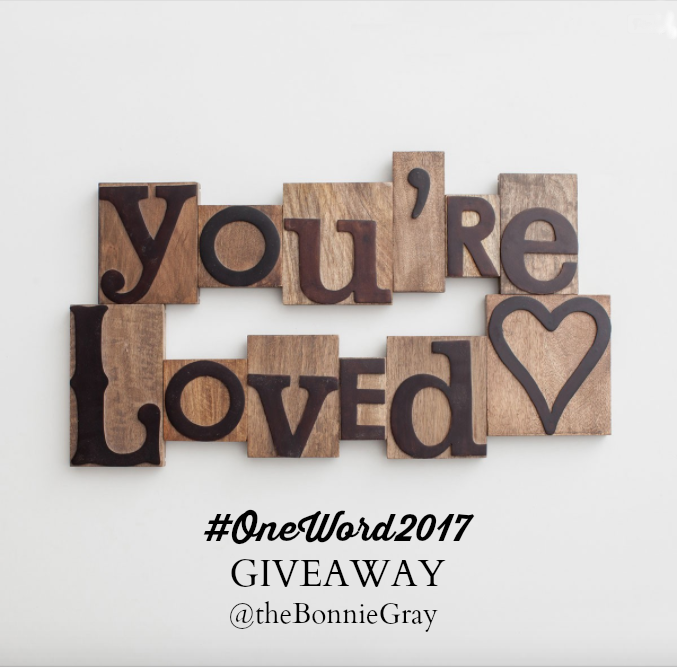 And if you hop on over to my blog, I have a special giveaway, just for you, as we celebrate the new year, as you share your One Word. 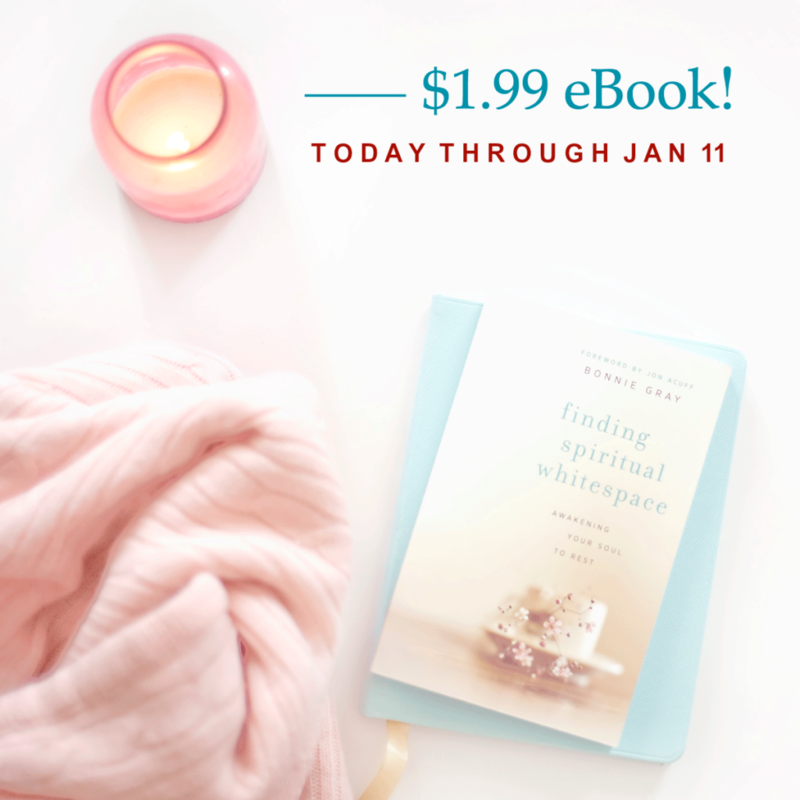 Now, coincidentally, unplanned, but just happened to be — my first book Finding Spiritual Whitespace – is on a special e-book pricing starting today for $1.99. So, if you haven’t gotten a copy yet, please, I’d love to meet with you between the pages, as we step into the new year. And later on, in May of this year — I have Book #2 coming! And so, it would be wonderful to get to know each other through our stories as we go on a new adventure for the soul. –– listen for your One Word. What is that One Word God is placing on your heart this year? Well, I am so excited to step into the new year with you. Remember that you’re loved. You’re cherished. Just rest. Okay, I’ll see you next time! Bye! What is your One Word for 2017? Let it be your One Word prayer. Pull up a chair. Click to comment. You’ll be entered to win $100 worth of Words Matter Letterpress Blocks, so you can build your One Word! * Who can you share today’s encouragement with? 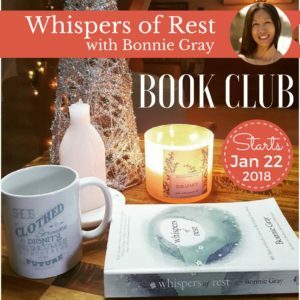 For more encouragement, get the $1.99 eBook Finding Spiritual Whitespace: Awakening Your Soul to Rest. One Random Winner will be selected to win DaySpring’s Words Matter – You’re Loved LetterPress Block Set or build your own $100 worth of Words Matter Letterpress Blocks. Enter by next Wednesday 7/11/17 Midnight (U.S. residents only). 3. Extra entry: Share today’s Giveaway on Facebook, Instagram or Twitter. Leave an extra comment letting me know. How it works: 1. Simply post a comment (or) 2. Write a blog post and link up below.Visit the post before yours to comment. 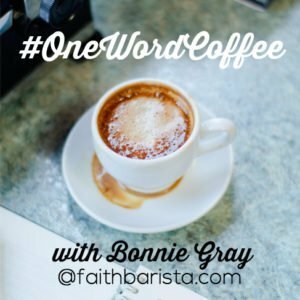 Use the #OneWordCoffee badge /click here/ in your post & link back. Love this! My one word for this year is Unstoppable. My word for last year was beloved. As I grew (and continue to!) in my understanding of my worth in Christ and who I am as His chosen, and beloved child, He also began to show me many things He wants to do with and through me. This year, I want to live knowing my God is unstoppable, and he is doing big things with me! Happy New Year Bonnie! I love your one word – Beloved, and these words: “God’s word can cover us in His presence and His peace.” So thankful! My one word for 2017 is Expect (Philippians 1:20) and He is continuing to show me how to Expect Him more – even in the midst of anxiety! Blessings to you in the New Year! My word for 2017 is Peace. Not peace on eart( though that would be good) but Peace within despite the storms that rage within. The unknown is such a factor. Decisions that must be made, some sooner than others , loom on the stormy horizon , and I want to do it right, according to His will( but I’m not sure what that looks like). He will give me Peace as my mind is set on Him. This I can do, and trust for the decisions made. hi barbra, i LOVE your one word ~ peace ~ a quiet north star of a whisper from God placed from his hand into yours as you hold onto our Savior this year. He’ll carry you through the storm. thank you for sharing! Thank you so much for your inspiring words. My work is Perspective. I want to keep things in an eternal perspective and remember what is truly important. Hi faith! hey, i like your name Faith! 🙂 and i like your one word ~perspective~ is such a guiding, clarifying word! from one faith barista to another. What a meaningful word you have chosen. My 2017 word is standing – as in Romans 5:2. So grateful to be secure in my standing in Christ, knowing that His mercy and grace will keep me standing. hi michele! love your one word STANDING – as the One who loves you stands with you holding you secure! happy new year! #Behold what matter of Love the Father hath BESTOWED upon us, that we should be called the children of God”. The worl Bestowed has blessed my heart. Our salvation is a gracious gift. hi linda, i hear a song, reading your One Word BESTOWED – how beautiful God is bringing joy to your heart. You are God’s gift! happy new year! hi kristy rose! i just love, love your name! it reminds me of dusty rose, which is one of my favorite colors and flowers 🙂 I think it is SO neat how God whispers to us, wherever we are – scrolling on FB, tattoos and all! Love your one word TRANSFORM. and your verse! so alive and vibrant. thnx for sharing! Hi Amy! Thanks for sharing your “One Word phrase”. 🙂 That sounds powerful! You’re putting love into action.. in you! happy new year! Last year was hope, and this year is REST! Beloved is beautiful. I am looking forward to what the Lord will teach me through this word this year. hi jennie! you know REST is one of my favorite words… !! it’s what makes me feel beloved. thank you for sharing your special One Word. I am so happy to imagine all that awaits you on your journey this year. REST is so powerful and beautiful. happy new year! Hi Bonnie, my word for 2017 is HOPE. The following verses are packed with “meat” for us to dine on and to savor. I love all the action words in these verses–actions that God has taken on our behalf and actions that we must take to demonstrate our trust in Him. I’m comforted and encouraged to know that our GOD, the Great I AM, is THE GOD of HOPE! hi jan! oh, I’m so happy to meet a fellow word-kindred!! Those verse are really life changing ones – and it’s beautiful HOPE is the word that remains on your heart and steps forward to greet you, from the heart of our Abba Father. To hope is vulnerable and I love how you put it “actions that we must take to demonstrate our trust in Him.” beautiful! happy new year! Bonnie, Thank you for another sweet, encouraging post! My word for 2017 is Walk, from Isaiah 30:21- “This is the way, walk in it”. Looking forward to what the Lord has in store for the New Year! hi kim, i LOVE your One Word “walk” – in the heart and in the body! it’s beautiful, active, intimate to journey with Jesus. how special for you! and Is. 30:21 is definitely one of my all-time favorites. psst… it’s one of my scriptures for one of my chapters in Book #2! happy new year! thanks for sharing, joy! just seeing the word JOY is happy! and it’s your name, too! wow! Definitely looking forward to Book # 2, because ‘Book # 1’ was a life changer for me! Blessings! Wow. I think God wants me to learn to really feel His love. My word is WONDER…it reminds me to look at everything with a fresh perspective, find the extra ordinary in the ordinary, be playful, grateful and full of joy…and to add to this I’m doing “my year of wonder project” on Instagram and sharing what I find each day…sending blessings and a sense of wonder to all of you! Fingerprint. God spoke all things into existence EXCEPT man! He formed me with His hands and breathed His air into me, leaving His fingerprints on me! How incredible, I have God’s fingerprint on me! Hi Cathy! that is so beautiful- your One Word whisper from God is his very touch! His fingerprints on your heart! thank you for sharing! OBEDIENCE…learning to listen & follow…strengthening my integrity…experiencing deeper faith through study & practice of this word in 2017…excited about the journey! Thank you for encouraging me…mentoring all of us. Praise & blessings for all you do. Thank you – I look forward to your book! And appreciate your encouragement. Thank you for your beautiful sharing today! I am always so blessed by your videos when you take us with you on your nature hikes! My one word for this year is “Stillness” as in Psalm 46:10. Blessings to you in this New Year! hi bettie! Stillness is SUCH a powerful, beautiful One Word for the new year. Just saying it brings God’s calm and peace, doesn’t it. Thank you so much for your encouragement. 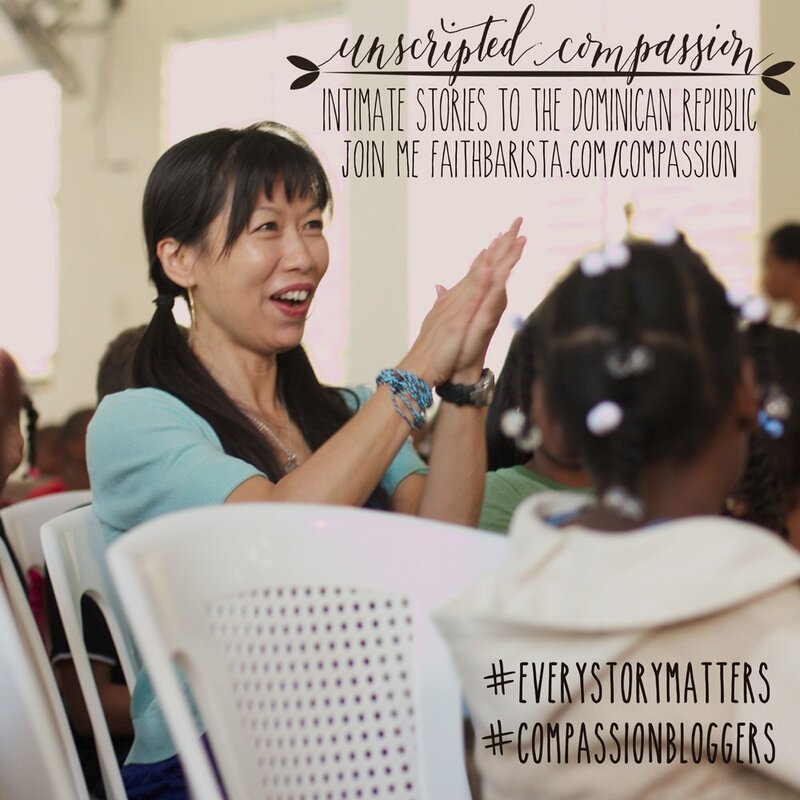 It inspires me to know what I’m sharing is speaking to you & inspires me to keep sharing. Thanks for stopping and spending time here. 🙂 Happy new Year! My word is REJOICE. from Philippians where we are told to “rejoice always, and again I say rejoice, the Lord is at hand”… I love this book and the lessons it contains. It is so often easier to grumble than rejoice, so this word reminds me daily to look for the good, to rejoice, even in difficult times, to Trust God’s hand in all things, for He is with me. I am so glad to watch you grow stronger and share. Indeed I am God’s Beloved and that causes me to Rejoice! hi mary! thanks for sharing your one word REJOICE – and how this whisper prompts you to trust in God’s hand and lean into him in this new year! Thank you for your words of encouragement – with the support of kindreds like you – Words are my soul language and God has used it- and continues to use it to encourage my heart through kindreds on this journey who also love words and God’s whispers! Hi Mary, I don’t know you, but my word is rejoice too! Even from the same scripture. It’s the best place to start a new year – rejoicing, don’t you think. God bless. My word for this year is BELIEVE. It has been a very difficult season for me with panic attacks, stress and anxiety. I have been almost paralyzed at times and have had a hard time believing God still sees me and cares. I feel,so,alone. I have been praying but my prayers seem to go no where. As the new year begins, everything I have heard, spread, songs have been about the word believe. I feel,like I am taking baby steps but I am determined to believe and hang on to the One who hasn’t left me and who does care so much for me that He sent His only begotten son so that I might live. Please pray for me. hi kathleen, such a beautiful word BELIEVE whispered on your heart, right in the midst of your very scary moment in panic attacks. As God whispers this word to you ,through all you are hearing, songs and reading, may you find that desire is in fact God’s gentle hand in yours. i had panic attacks – very debilitating ones for two years but I found that it was a season for me to investigate what the panic attacks attacks are expressing. I don’t know your sitatuation, but for me, nothing was “wrong” with my life, but those feelings of deep aloneness was childhood emotional trauma surfacing, not to harm me, but to bring me through a journey of healing. 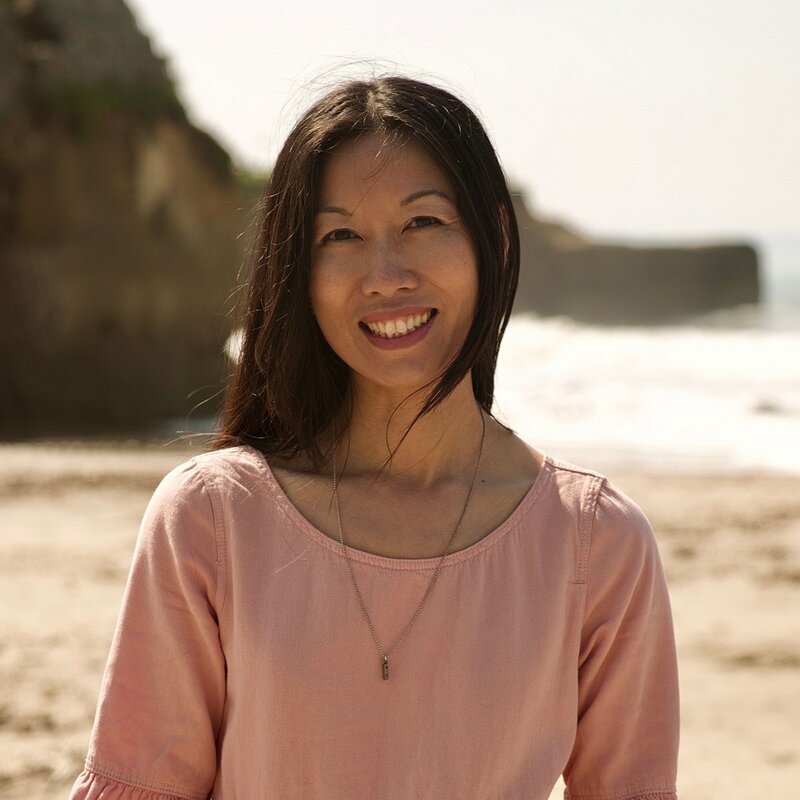 I needed a EMDR therapist to guide me through my memories, because I had no idea what was wrong.I wasn’t thinking anything worrisome when the panic attacks would hit. Please do get a copy of my book, as I wrote it to share about that journey that was bewildering, of rest and beauty. And I hope it encourages you. Another book that helped me take action is “Healing is a Choice”. You sharing and others who have emailed me is inspiring me to do Facebook LIVE Q&A about anxiety… Dear Jesus, help Kathleen. Calm her heart be continuing to reassure her to BELIEVE – and take actions to investigate and nurture her soul, body and mind during this time. Bring people on her path to listen and encourage her, just the way you would if you were here. In Jesus name, Amen. My word this year is joy–not just superficial surviving smiles, but overflowing peace. I want to revel in what God has placed before me, noticing and delighting. My word is NEAR. I joined your link up today Bonnie!! I love Beloved. God has given you that word and it has helped you so much through the years. Love you friend. Hi Mary. I word is trust. Trust that God is true to his word. Knowing without a doubt that I can always trust Him. Shared on FB and tagged a friend. So much fun reading through the previous comments! My one word is LIGHT. Over New Years weekend we were with my in-laws and our present to my brother-in-law was a wonderful flashlight and his to us (and his parents) was new amazing light bulbs. We gave each other gifts of light! Then you asked about the one word, Bonnie. I thought of light immediately but then also reflected on the name Lucy which means light and how the year is going to be focused on the project I have with my daughter to present a musical of Lucy Snowe from Villette by Charlotte Bronte and for me to write a book about the novel and maybe together write a screenplay. So Lucy’s light is shining! And then I remembered how in May 2014 God told me “you also are Lucy” (Pevensie, from Narnia), and again when the prayer leader asked God, I saw light. So it’s a reminder and a guide (“Your word is a LIGHT to my path.”) for my year. Love to all who gather here! New Year’s blessings dear friend. as He unpacks more I will share. And yes, you are beloved indeed! My word is wisdom. So I’m studying James and Proverbs. My word is LOVE. But that really does not say what I think God is saying- He wants me to work on loving people as He loves them. My word for the year is ‘pursue.’ To really just pursue God without strings attached or asking for anything. Just to seek Him and know Him more. Thank you for sharing you OLW with us! My word for 2017 is “Awaken” and it is so exciting. I have so much anticipation for this new year and all that God has in store for me!! I am restructuring my life this year to spend more time with my Lord… sitting at His feet. Planted and Linger…I think they work together! Shared on Facebook and Twitter…. Mine would be ‘Joy’ too … uncircumstantial joy … I pray this blessing over all of u.
Hi, Bonnie. My one word is worship. I’ve been focusing too much on my problems. I think it’s time I turn my focus to Him. I love your word for the year. As I write this, I’m still waiting on God to reveal my word–several are in the “running” but nothing has seemed quite right yet. In His time, I know God will make the word clear. Intimacy. . .soul searching, uncovering who I am on the inside and following my heart leads me to seek relationship. . .spiritual intimacy. . .with my maker. It creates an atmosphere that constantly reveals who I am in an environment of love. Intimacy with God through Jesus. . .helps me share who He is creating in me with others. I have always felt most sincere exchanges occur one-on-one. There is no pressure to cater to others expectations. . .and a freedom to bare ones all and best. . .and worst. And being committed to building intimacy with God. . .opens us to being most true with others. . .and more capable of shining light in dark places. . .more prepared to share ones testimony and faith. More willing and able to surrender to His glory through service and humility. My word is Intimacy. My word is actually two–two synonyms: walk and step. Sarah Young, in her book, Jesus Calling, confirmed this choice just this morning. For January 5 she wrote about our life-journey requiring profound reliance on Him. “It is a faith-WALK, taking one STEP at a time, leaning on [Jesus].” This is what I want to experience, taking risks and moving forward with Spirit-infused courage into arenas where I’ve not ventured before. Hello Bonnie! I love your word for this year and know you are excited to see how God unfolds it in your life. My one word this year is “perseverance.” I confess I was less than thrilled initially, but God in His mercy is warming me up to it. I love this quote from a devotion a friend sent me when she heard what my word for the year is: “Perseverance is the rope that ties the soul to the doorpost of heaven. Without it even the most pious will fail. With it, the most stupid will attain.” Although I laughed out loud over the last sentence, I do love the visual this description given about tying my soul to the doorpost heaven. I have a feeling I’m going to need that link! I can never choose any other word but Jesus! My one word is kindness. Loved hearing the birds on your video Bonnie! Hi Bonnie! My one word is Forgive; to have an attitude of forgiveness. Lasr year my one word was Discover. I discovered much about myself & what I was relying upon other than Jesus–people-pleasing, personality, & perfectionism. I discovered much more about grace. This year my one word is Experience. I believe I will experience the power, promises, & presence of God in a greater & deeper way. My word for the year ahead is incarnate – I sense an invitation to embody healing energies. Last year my word was “create” and my verse was “Create in me a clean heart, Oh Lord.” This year my word is “believe.” God has placed on my heart to get rid of my old thought patterns I must “believe” his Word to find my worthiness. There are several truths about our identity in Him. This week I am focusing, praying, illustrating these two verses: I am a temple in which God dwells (1Cor. 3:16) and I am chosen by God, holy and dearly loved (Col. 3:12). Thank you!! My one word for this year is “time.” I have some specific goals I want to accomplish this year and each of them will require more time than I’ve been able to spend on them this past year. It is so easy to get distracted by regular daily life interruptions – some of them are important and some aren’t when I look at the “big” picture of life. I’ve observed so many of my friends look at their phone every time they are at a stopped traffic light, at most every opportunity at work and at home. It is a Facebook, Instagram, Twitter addiction! I have a FB page, Instagram and Twitter account, but I rarely use them because they can be such a time consuming thing and when that happens, I think it is an addiction. Since I observed friends doing this over the past year, I started looking at what distracts me from something I am working on that will be part of accomplishing one of my goals. I am a studio artist. With those observations in mind I am committing myself to make every minute of my time invested well, whether it is working in my studio or time with friends, volunteering, studying God’s Word – I am going to work toward choosing each what, who, when and how to invest my time. I am struggling to find one word that fits….but I do know that God does not want my word to be Worry. So I am searching the scriptures for that one special word to replace Worry, maybe it will be Trust…not sure yet. I love your devotionals. They speak to my heart. I just read ‘Three Simple Soul Care Practices to lower Anxiety’ and it was just what I needed to hear! I loved watching your video, Bonnie. I always appreciate you taking time to share what God put on your heart. My Oneword is actually two this year. It is Healthy Changes. Watchful is my One Word for 2017. I want to be watchful of how I spend my time and my money. To be awake and aware of the moments, and not sleepwalk through the mundane. I also want to be watchful of how God is working in my life and through my circumstances. My word for the year is Loved. I am learning in new ways how much God loves me. I want to continue knowing & understanding this more fully throughout this coming year. And then, show His Love to those around me. My word for 2017 is “Uncluttered”. Physcally, mentally, and spiritually! My word is silly, I tend be take life so serious, being silly puts a smile on my face and others. My word for this year is “present”. Sometimes I feel like I’ve lived in reverse or fast forward with thoughts all over the place. I want o be intentionally present in all situations no matter where and with who I am. Love how you challenge me! Also made comment on Facebook and shared on Instagram. Glad you are doing this again this year, Beloved Bonnie. You were the first one who got me interested in asking God for a Word for the year through one of your older blog posts, and I’ve been happily doing it ever since you got me started. My Word for this year is “Joy”. I shared your giveaway post on Twitter as well. Looking forward to the release of your new book this joyous year too! My one word for 2017 is ‘me’.. Weird isn’t it? It’s not the selfish kind of ‘me’ but rather the ‘me’ that needs to push herself out of her comfort zone and to show the love that she feels for Jesus to everyone around her. I tossed around other words like believe, teach, peace, etc. etc. but every single time, the word ‘me’ was front and center. . . We shall see where it goes! My word is “good.” 2016 is a hard year and none of the situations are improving. I need to focus and focus and focus again on the goodness of God and His good purpose in my difficult circumstances. My word is Optimistic! I want to surround myself with people who have optimism in the future and in what the Lord’s plans are for our lives! I want to inspire others to live a life where they make a difference just based on how they treat people. One smile, one “thank you” or “you look nice today” can make someone’s day. I want to be optimistic that I will be given opportunities to share the gospel and that I will be able to show the love of the Lord to my children and husband by how I treat them and serve them. My one word for 2017 is “Bloom”! I thought of growth, but it wasn’t quite right.. I thought of expansion because I wanted to let myself expand into new areas of growth, now that I’m an empty nester. But the word “Bloom” came to me because it means growth, expansion, and becoming beautiful. And these are all things I want to do in Christ. My word for 2017 is gratitude. 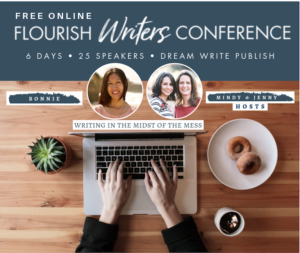 Hi Bonnie, My word for 2017 is re-connect. Blessings to you! Thank u so much for being u and sharing ur gifts with us – love ur heart – love u! Last year’s word was JOY. Reading the posts there are so many good ones. I really like ABIDE too. Abiding in Christ is certainly necessary in order to be fully alive. Hey! I’m so excited to hear the book is coming soon! My birthday is May 7th and I’m getting this book for sure! I can’t wait! Been praying for you since you announced you were writing a second book! Hugs! It’s the perfect time of year for being motivated both physical and spiritual. My word is “Onward”. 2016 left me feeling stuck, so I’m setting my sail onward! Thank you Bonnie for your inspiration! Hi Bonnie, my one word is REST! Hi Bonnie! My one word is peace!